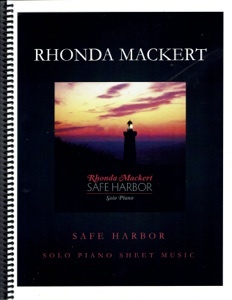 Safe Harbor is the companion solo piano sheet music book to Rhonda Mackert’s 2014 album by the same name. All thirteen tracks are included, transcribed note-for-note by Donovan Johnson; I proofed and edited. 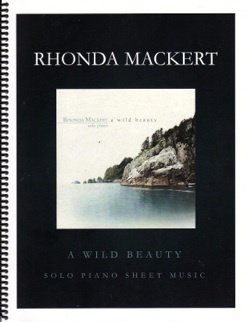 The book is spiral-bound and printed on a heavy paper stock that should hold up for years of piano playing pleasure. The layout is roomy and uncluttered and the print is crisp and clear. None of these songs are what I would call difficult, so pianists at an upper-intermediate and above level should find much to enjoy without having to work too hard to learn the music. There are a few places where the timing is a little bit challenging, but again, nothing really difficult. None of the songs are composed in complicated time signatures, and there are no reaches of more than an octave. The music itself is mostly relaxing and uplifting, so pianists of all ages should find many fulfilling hours playing this music. 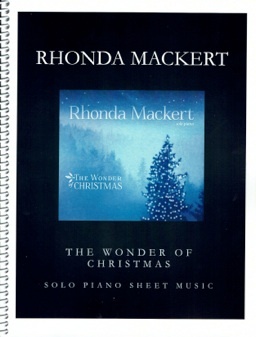 Piano teachers can be assured that this is music that their students will enjoy learning. 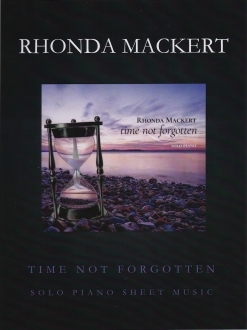 This songbook is available in printed form or as a digital download (single pieces or the whole book) from rhondamackert.com. Recommended!